Overall, the Lowrance HDS-7 GEN3 Insight Fishfinder/Chartplotter with CHIRP/StructureScan is a highly advanced unit manufactured to provide fishermen with maximum situational awareness at the sea to minimize the hassle of finding fish on their own. Although some users may not find it too easy to operate this high-tech unit, but it is surely an investment no one will regret in the long run. Are you looking for the easy ways to improve your fishing experience? Do you hope to find some better locations to cast your bait? 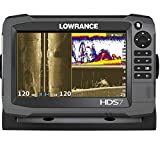 If you are nodding your head in yes to these questions, then it’s the right time to get yourself the sturdy Lowrance 000-11788-001 HDS-7 GEN3 Insight Fishfinder/Chartplotter with CHIRP/StructureScan. This model is guaranteed to serve as a truly efficient method to reach your prey. This Lowrance chartplotter and fish finder combo can locate the area with a good amount of fish. Also, you can mark that spot for later as well. What could be better than having a chartplotter and fishfinder as one device in your hands? Don’t you want to make your fishing adventure memorable? Well, this model by Lowrance presently has one of the finest multifunction displays based on the combination of a Gen3 plotter and fish finder. The gadget incorporates multi-touch along with the standard button navigation system. Plus, CHIRP sonar 83/200 kHz transducer as well as StructureScan HD sonar LSS-2 transducer are also there to operate at the frequency of 455/800 kHz. It further offers 600ft of coverage from side to side. Moreover, this device is perfect for both, deep and shallow water scanning. Now isn’t this a plethora of technology to locate fish and identify structures beneath the boat? The Lowrance HDS 7 GEN3 flaunts a 7-inch color screen with LED backlight, that enables visibility in all situations. Its multi-touch technology also provides ease of use. The depth capacity of this device is 750ft for the Broadband Sounder and 300ft for StructureScan. A 10Hz internal GPS antenna is also included to mark up to 200 routes and 5000 waypoints. The device has two microSD card slots so that users can easily take advantage of this feature by using one card for maps and the other one to save waypoints and sonar recording. You can even use its camera connectivity option to get a better view of what is underwater. Ever thought fishing spree is that effortless? This model combines brilliant sonar technologies with a wide array of navigation technologies to facilitate its users to reach hotspots conveniently to find a good catch.